Millions of gift-hunters have blitzed shops and malls across the UK on one of the busiest shopping days of the year. High streets have been preparing for hordes of shoppers on the last full weekend of shopping before Christmas. Despite predictions of a slow start, shopping centres say sales are up on last year, with experts pointing to boosted consumer confidence. However internet retailers are expected to benefit most from the growth in spending. A survey published last week suggested that almost two in five (38%) British adults would do some of their Christmas shopping online, up from 22% in 2001. Around the country, shopping centres have already reported high numbers. Half a million people are expected to flock to Oxford Street in London, which has become a pedestrian-only zone to boost numbers. A spokesman for the Oxford Street Traders' Association denied retailers had been struggling in the run-up to the festive season. "The closest Saturday to Christmas is historically the busiest day of the year for Oxford Street. "November showed an upward growth for the first time since July. It has been challenging since July, but the increase in the last few weeks has been encouraging." In Newcastle, a spokesman for the MetroCentre said they were expecting a busy Saturday. "We hit the 100,000 mark every day this week and I'm sure it will be the same today," he said. "Shoppers don't seem to take much notice of the national trend up here. We're big shoppers whatever happens." Sheffield's Meadowhall complex was also expecting a large turn-out. Managers there believe many shoppers are leaving things to the last minute this year in an effort to get the best discounts. A spokesperson said: "We've seen a steady Christmas so far and we are expecting it to be a really, really busy last week. "It seems quite a lot of customers are leaving it to the last minute this year. "It's like they are playing a game with the retailers - if they hold off long enough, they believe the shops are going to discount." At Braehead, near Glasgow, the number shoppers coming through the doors at the weekend was estimated to be in the "hundreds of thousands". Meanwhile, at Edinburgh's Ocean Terminal, staff were prepared for "extreme shopping" on Saturday. Duty manager Fay Jameson said: "We're going to have at least 60,000 people through the doors this weekend, it's extreme shopping and we've been flat out from first thing this morning." 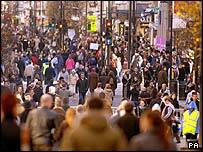 Retail analyst FootFall said shopping visits increased by 9.5% last week compared with the previous week. But levels were still down on 2003 and 2004. Natasha Burton, marketing manager at FootFall, said online shopping, the rise of the supermarket and a reduction in what people were spending were to blame. "But I think it is now ramping up," she said. "People are realising there is only one week to go and so the final crunch is coming."